Last week we distributed a quantity of promotional chocolates to a few local coffee shops. The chocolates carry the Put Orange First branding and will be distributed as appropriate to customers. We’ve purchased a thousand to start the ball rolling and depending on feedback, we’ll print more soon. It’s a bit unique but as part of Put Orange First, we’re offering four $5000 Marketing Grants to four local businesses. Surprisingly, very few applications have been received so far but they don’t close for a week or two yet so there may be more to come. Each prize is $5000 worth of advertising in OC Life and expert marketing advice along the way. This is something we’re trying to get started on February 23rd and on the last Saturday each month until Christmas. It’s a simple retail strategy with unlimited potential but like most things, support from local businesses will decide its fate. It FREE for businesses to participate and we’re hoping 50 or more CBD businesses will want to give it a go. OCL and Radio 2EL are doing the publicity and providing huge posters for the event, all local retailers have to do is put some specials on the day in their stores. It’s dead easy! Team Orange is intended to bring together some wise business heads to brainstorm ideas and issues that will make Orange even better than it is now. The group met for the first time last Thursday and here’s a snapshot of some of the things that were discussed at our first meeting. At this stage, it was more about discussing what were the areas where we felt we could make a difference. We discussed how the community may view our present group of Councillors. Their lack of vision and the way they seem to now flip flop back and forward over issues was a concern. We thought about what was needed to kickstart or lead us to overcome some of the issues that frequently get talked about. Issues such as the local shopping image, the number of empty shops, jobs creation etc. It was determined that by building a strong business sector, all these and more could be addressed and overcome. We discussed how Orange could market itself better. Clearly the food and wine sector is doing a great job but there’s a lot more to Orange than just that and we should have a program to address that. Working towards having Orange known as a “welcoming” city and encouraging everyone, both behind counters and the public, to smile more were two suggestions. Marketing Orange as the Go2 city for lifestyle opportunities was another thought. We have outstanding educational facilities, brilliant medical services, a mining industry, beautiful scenery, a wonderful lifestyle and more. If we promote these as well as we promote our food and wine, Orange must surely grow. Team Orange will continue to meet each week over coffee and keep readers up to date with happenings. To help fan the Put Orange First theme along, we’ve introduced a couple of new themes into OC Life and we’ve produced a series of small ads to keep pumping out positive and encouraging messages. 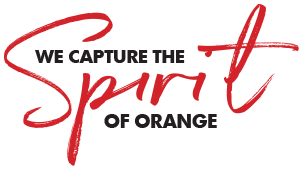 The new themes are Road to Success and Building a Better Orange, and both will feature people and things that should inspire us all.